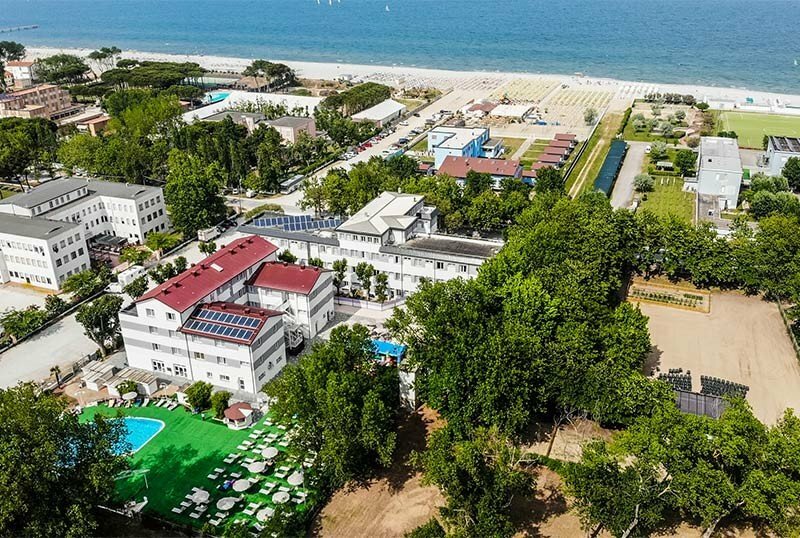 Newly built, the Color Green Village of Cesenatico is designed to live an eco-friendly holiday in contact with nature and with all the comforts of a village. So much entertainment, but also services for children and gastronomy with the possibility of choosing between 3 restaurants. It has a private beach, swimming pool with hydromassage and parking. It offers guests access to the Atlantica Water Park and allows pets up to 10 kg. This hotel adheres to the Green Booking project and has decided to donate a tree to the coast for a healthier environment and a more sustainable tourism. The property is located in Cesenatico a few steps from the private beach and close to the Parco di Ponente. The rooms are furnished in a minimal style and all are equipped with WI-FI, 32 "LCD satellite TV with Sky channels, air conditioning, minibar, safe, bathroom with shower, hairdryer and clothes rack. .
GREEN ROOM: 16-18 square meters wide, with window and possibility of balcony on request. It can be equipped with a double bed, a bunk bed and a cot to accommodate up to 5 people. GREEN ROOM ECONOMY: measuring 14-16 square meters, with window, a double bed and a bunk bed. It can accommodate up to 4 people. None of these rooms has a balcony. GREEN DELUXE: size 20- 24 sqm, with window. It can accommodate from 2 to 5 people and is equipped with a double bed, a bunk bed and, in some, possibility of adding a cot. JUNIOR SUITE: consists of two connecting rooms with a window and a bathroom. It can accommodate up to 6 people. SUITE: includes a bathroom and measures 45 square meters, suitable for up to 6 people. It has two double beds, a bunk bed and allows the addition of a cot. FAMILY ROOM: consists of a bathroom and two connecting rooms, one with a double bed and one with a bunk bed. It measures from 26 to 28 square meters and can accommodate up to 5 people. Swimming pool, garden of 150 thousand square meters, bicycles, laundry area available, gym, satellite TV room with Sky channels, reading room, open bar from 10 to 24, pool bar in the pool area and green bar in the garden open during the evenings and shows. At guests' disposal: lift, beach towel (free with deposit) and free shuttle service to the airport, railway station and port of Cesenatico. There are 3 theme nights each week, including a Romagna evening, a fun fair and a white cruise party. Free for all guests regardless of the chosen treatment: entry to Atlantica Water Park (from 15 June), 1 hour of tennis per day, beach service with umbrella and two beds, aperitif every night, children's snack every afternoon. CONVENTIONS: beach, tennis courts, New Ghibli boat, shuttle service, organized excursions, reductions for Mirabilandia and Italia in Miniatura, free admission to Atlantica (from 15 June). SERVICES FOR DISABLED: entrance on the ground floor, lift for disabled people, rooms on the ground floor with adequate room for maneuver and wheelchair-accessible shower. PETS: dogs up to 10 kg allowed. The hotel dedicates them a fenced-in area to the garden. LUNCH AND DINNER: front cooking buffet with the possibility to choose between 2 restaurants "farm-to-table": a traditional restaurant and "Scamporella" for those who prefer a picnic under the stars. The hotel also has an open bar (10-24), poolside pool bar (10 am-6.30pm) and a green bar in the garden. In hotel: educational farm with botanical garden; indoor mini club area from 0 to 10 years with games for various age groups; junior club area from 10 to 18 years with table football, X-box, Wii Billiards, Playstation and Junior Outdoor Zone; inflatable area for 3 to 12 years, outdoor mini club area; baby sitter from 3 to 6 years free (13-18 / 20-23); daytime and evening village live entertainment with 8 animators; free pediatric assistance; strollers. In the room: cots, night light, toilet reducer, bath tubs. At meals: kid's restaurant dedicated to children with a dedicated chef every day; kitchenette for mothers open 24 hours a day and equipped with fridge, microwave, bottle warmer; afternoon snack; baby food and baby menu; bottle warmers; pizza-nic evening in pine grove. On the beach: playground area with inflatables. The garden has a 35 m² swimming pool with hydromassage corner, supervised by a life guard and surrounded by a large sunbathing area with sun beds and beach umbrella. The area is complete with pool bar open from 10 to 18.30. 3 themed evenings are organized during the week: Lunapark, Romagnola, White Cruise and an evening Pizza-nic for children in the pine grove. Among the proposed activities: Yoga and Pilates, fitness in the Parco di Ponente. The structure is associated with Legambiente and offers a holiday in the name of eco-sustainability, with green energy from solar panels, 0 km kitchen and local products, educational farm with botanical garden for children, sports routes and activities such as yoga and pilates. outdoors, night in an outdoor tent, fenced green area for dogs. 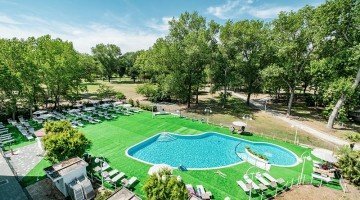 The Green Village offers a private beach where all guests can use basic service (one beach umbrella and two beds per room), area equipped with games, castles and inflatables and bar service. Summer is coming and the Color Village of the Green Village arrives. A fun and relaxing holiday, immersed in 150 thousand square meters of Natural Park ... that after all those months of work is just what you need! All you have to do is welcome the first warm summer with open arms and let yourself be guided by us. We have already thought of everything! Contact Us! We love July, the beaches are still uncrowded but the temperatures are warm and pleasant and the days are the longest ever. It's one of the best times to stay at Color Green Village! you who look at them from the sunbed on the beach or comfortably from the pool bar .... This is that it is Holiday! August it is absolutely forbidden to stay at home! It's time to get away from the chaos of work and the city, and what it takes to recharge your batteries is the Color Green Village! Come and enjoy a fun and relaxing holiday, surrounded by 150 thousand square meters of Natural Park ... that's just what you need to recharge! And while you relax, your children play and participate in many activities and initiatives organized by our animation staff. We are almost at the end, but the Color of the Green Village does not stop. The sun is still high in the sky, the sea is more welcoming than ever, and you are ready to take advantage of these days of tranquility and relaxation before returning to work, while your children enjoy the last days before school. All you have to do is let yourself be guided by us. Contact us by March 14th not to miss this fantastic offer!